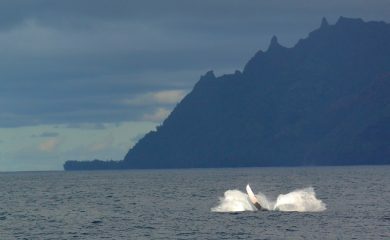 2-22-2019 After two weeks of stormy weather a whale breaches off of a calm Napali Coast. Take a tour of some of the spots around the island. Photos and information. Find out who Naia and Splash are. All the information that we are going to tell you. Boat Tours, Luaus, Scuba Diving, ATV, Kayaking, Helicopter Rides, Horseback Rides, and more. Kauai Island products Koa Ukuleles, of course Captain Splash's Photo CD, and Hawaiian Music CDs. Explore Kauai from home through Captain Splash's Photos. An internet tour of the island of Kauai. It is just a few clicks away and is free. Splash's thought about Kauai. There are some pictures. Who are Captain Splash and Naia ? This is the place to find out . Send us your questions and thoughts. The National Weather Service's Honolulu Office. Lots of Weather information. The Newspaper for Honolulu. Good also for state news. The official site for Kauai County Government. Lots of information. You may have to work for it though. The public transportation for Kauai. Good luck.